Abstract: Celeron Slocket cooler shootout lineup for you all with some interesting gear and numbers. Here it is finally, a Celeron Slocket cooler shootout lineup for you all with some interesting gear and numbers. We all know that not all heatsink/fan units are created equal, and that lately there has been an upsurge in coolers put out in all sorts of shapes, sizes, and forms. Which ones work? Why should I spend $40 when another cooler will outperform it for $20? I am here to try and sort that out for you. All of these coolers, or most of them anyway's have been reviewed to death by numerous sites. That is not exactly what this article is about. It is what this site is based around, budgeted folks looking for the most bang for the buck. I will test and display 5 of the most abundant Slocket coolers available today, with varying price ranges and performance. First we will go over the basics of each unit, then a temperature comparison at the end to show which ones perform the best, and which ones do not. 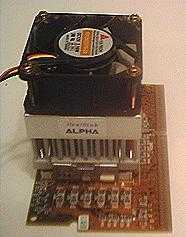 First off is most certainly one of the best know names in cooling, Alpha. Known for it's effective design, shear size, bold looks, and killer performance. The Socket 7 / Socket 370 cooler from Alpha is one of the largest in this class, with a lot of pin-fin's on a stout base plate, well designed fan mount/shroud, and effective locking mechanism it is one of the best on the market. Alpha's are also known by price, and at $29 a pop it is not a cheap solution at all. Or, if you already have a 60mm fan, a kit will cost you an entire $9 bucks less. Still, for the money it does it's job and well. Next are two solutions from GlobalWin, or more affectionately known as "Alpha Killers". They do live up to that name, and literally tower in size over the Alpha which is no runt by any means. The first of the GlobalWin fam is the biggest hs/fan combo to ever grace your Celeron. The FDP32 in fact won't fit on some boards without hacking up the sink with a saw or Dremel. And get this, they come in under the price of an Alpha at only $20. Yes, that is with basically the same YS Tech 60mm fan that moves a lot of air across that monster sink. This is the one that resides in my case at all times, unless testing others of course. Very large, very effective, and attractively priced it is sure to please most cooling freaks as long as you can fit the damn thing on the board! GlobalWin decided that BIG isn't always good, so they shaved a little off the above unit and made the FEP32 which still may not fit all boards. It is still larger than the Alpha, but a little easier on the wallet at only $19. Same fan, same great latching mechanism as the FDP32, only a little smaller so you might be able to get it to fit better without totally hacking up the sink, or bending out too many capacitors. That is always a good thing!